When you have outgrown your current home, you then start the process of looking for a new house. As part of this process, you typically have a list outlining the criteria that your new home must have (eg location, number of bedrooms, bathrooms, garage, etc). To complement this list, there are also the “nice to haves”, which could vary from a spa and sauna to a star gazing observatory in the loft, plus more! As you progress through the searching process, for those houses that you are interested in pursuing further, there are three real estate signs located outside the front of these homes that typically catch your eye, “Sold”, “For Sale” and “Open for Inspection”. “Sold” – forget this one, too late……but how much did it sell for? 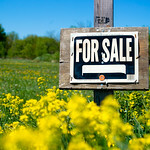 “For Sale” – this looks interesting, I wonder what it’s like inside? “Open For Inspection” – yep, let’s go in and have a look around and check it out. This house searching process got me thinking……how do we promote ourselves in our place of employment and externally in the market from an innovation and creativity perspective? Do people also view us with us with these “real estate” signs? “Sold” – no new ideas, no interest in thinking differently, go away and stop bothering me! “For Sale” – you have a range of valued creative ideas that you would like to share and promote within your workplace and the broader market. “Open For Inspection” – you have some innovative thoughts that you would welcome feedback from your work colleagues which can then be modified as appropriate. So…..what sign are you displaying?